Its common knowledge that most of us living in the western world, inhabit a toxic environment, sadly the air, the land, the water and the food we use are contaminated by the thousands of man-made environmental chemicals. While "the human body is perfectly capable of dealing with limited exposure to many of these toxins within a given time frame. However, once you come into contact with and ingest more of these toxins than you can cope with, your body has no choice but to store those toxins until a later date when hopefully you clean up your act. Typically, these toxins are stored in fat cells but they may also be stored in your muscles, organs, and other tissues." Your first step in promoting longevity and reducing the potential risk for disease, is for you to authentically embrace your true core values. Healing that is sparked by emotional strength, which empowers your immune system... this is why the cleansing process and healing process is an holistic undertaking, incorporating your mindset as well as physical processes. While I was training to become a health educator at the Hippocrates Health Institute, I experienced my deepest cleanse to date, over three months, which was a profoundly life-changing process. I felt deeply cleansed and energised; I was clean from the inside out! This rewarding experience inspired me to create a series of short cleansing programmes so that you can easily sample effective cleanse protocols. This kind of cleanse provides your body with maximised nutritional benefits for accessing nutrient dense food, that provides Alkalinity, Phytonutrients, Antioxidants, dietary Enzymes, Plant Fats, Vitamins and Minerals and dietary Fiber. You can break these protocols down into manageable chunks if you like to get you started. Fasting, juicing, clean eating, cleansing diets, physical detox, self-care, mental and emotional health and spiritual grounding for health and wellbeing are all part of the cleansing and maintenance process. You can work on introducing each protocol individually into your wellbeing lifestyle, but combining them allows you to come up with "a super-charged package for enabling the body to restore its own natural vibrant health." This diet helps your body to cleanse by feeding your body at the cellular level with what your body needs for health. It's not just another diet, but a healthful, delicious, and – most importantly – sustainable way of changing your eating habits that you can happily maintain for a lifetime! breath, skin, urine and bowels. By using some or all of these protocols you can reduce or completely eliminate any uncomfortable cleansing reactions. Thats exactly what I did, I used all of these methods (but you don't have to). I felt as though I was being given the most transforming gift. The reward for you from working through this process and getting all the toxins out, is a new, vibrant, radiant and healthy you! As a welcomed bonus, I lost over 20 Ibs, dropped two dress sizes, improved my digestion, increased my energy several fold and felt supremely grounded and happy. I have devised a variety of short introductory, online cleansing programmes, which you can easily do at home, for a fraction of the usual cost. 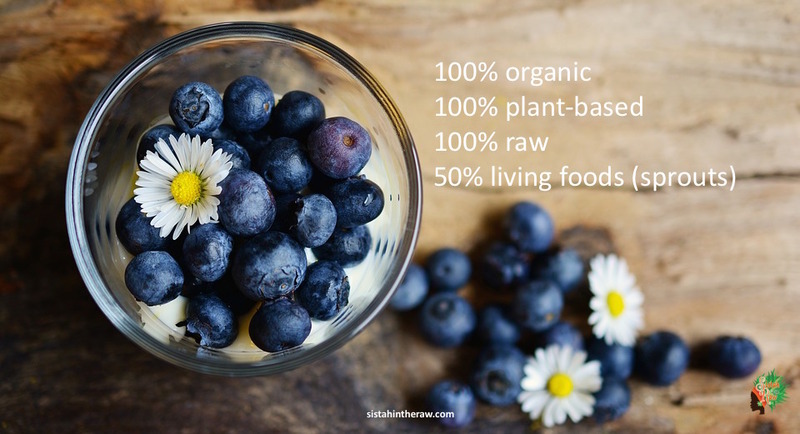 Use these 1, 3 and 5 day programmes to begin or continue your wellness journey, and experience and understand more fully, the benefits of what cleansing with a healthy living, raw food, plant-based lifestyle has to offer. Time to make your eyes sparkle and your skin glow. Immerse yourself in the process with an online programme, followed up with one-to-one mentoring. The new Sistahintheraw 24 hour Simple Cleanse Programme arrives for you this week, as part of my Self-Care month and is available until September 2017. Once you've got them. try repeating the programmes which is a great way to gain momentum and to reinforce your inspiration and commitment to change strategy. Want to know if these programmes are for you? Newer PostLove Your Gut - Digestive Health with Raw Food!